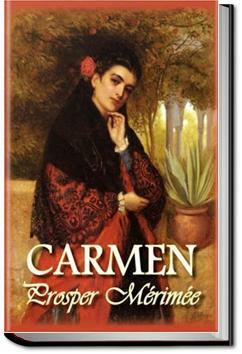 On a trip to Spain in 1830, our narrator recounts his encounters with two strange characters: a thief named Don José Navarro and a beautiful Romani woman named Carmen...little does he know that soon, these two will be entangled in a tumultuous love affair that spells out tragedy for both parties. . . .uay watch the bathers, straining their eyes, and seeing very little. Yet the white uncertain outlines perceptible against the dark-blue waters of the stream stir the poetic mind, and the possessor of a little fancy finds it not difficult to imagine that Diana and her nymphs are bathing below, while he himself runs no risk of ending like Acteon. When I read a story, I will write the review under the title. This Kindle version is fantastic with footnotes and easy navigation which is important to Kindle readers.